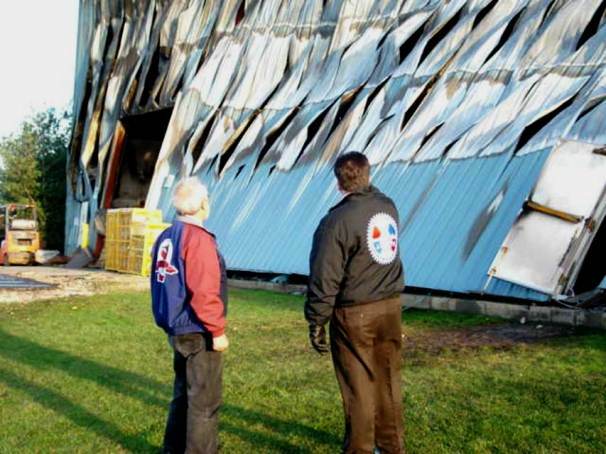 IAM Director of Community and Membership Services Charlie Micallef (left) and District 54 President T. Dean Wright examine scorched remains of Janesville Acoustics in Newcomerstown, OH, where a fire put nearly 60 IAM members out of work. A fire at the Janesville Acoustics factory in Newcomerstown, OH destroyed the facility and left members of Local 1285, District 54 and the local community facing an uncertain future. The facility, which manufactures automobile insulation, provided employment for nearly 60 IAM members and was poised to triple in size in the near future. No cause has been determined for the fire that broke out while workers were in the facility. All employees were evacuated without injury. Before the smoke cleared and the embers cooled, Wright was scheduling meetings with members of the Shop Committee and the employer to determine what assistance the union could provide. “We want to assist our members and the company,” said Wright, who added the union’s relief efforts would include probationary and non union employees at the facility.